Manic Street Preachers are a Welsh alternative rock band, formed in 1986 in Blackwood and consisting of James Dean Bradfield (lead vocals, lead guitar), Nicky Wire (bass guitar, lyrics) and Sean Moore (drums). They are often colloquially known as "The Manics", or simply, "Manics". 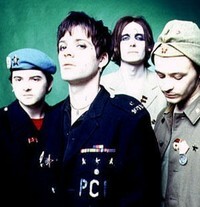 Originally a quartet, the band became a trio when primary lyricist and rhythm guitarist Richey Edwards disappeared on 1 February 1995. Their early combination of androgynous glam imagery and critical social lyrics about "culture, alienation, boredom and despair" gained them a loyal following and cult status. Following Edwards' disappearance, Bradfield, Moore and Wire persisted with Manic Street Preachers, and went on to gain critical and commercial success, becoming one of Britain's premier rock bands. The band's later albums retained a leftist politicisation and intellectual lyrical style while adopting a broader alternative rock sound. Altogether, they have garnered eleven Top 10 albums, fifteen Top 10 singles and have reached No. 1 on the UK charts three times—with their 1998 This Is My Truth Tell Me Yours album, the 1998 "If You Tolerate This Your Children Will Be Next" single and the 2000 "The Masses Against the Classes" single.